David Copher Gallery And Casita By The Plaza, and great skiing! Private 600 Sq Ft Casita In The Heart Of Santa Fe. Just Blocks From The Plaza ! A cozy Casita with Santa Fé style . A romantic bedroom with queen bed , T.V. and beautifully decorated with original art. A bathroom with wonderful new shower with full body spray , a mirrored wall . You"ll be delighted with the living room , beautifully decorated Santa Fé style , impressive art by the owner David Copher will surrounded you . A large leather sofa and a twin hide-a-bed ! The Kitchen is bright and efficient with stove top , coffee pot, micro wave ,toaster oven and fridg. Out door patio and off street parking. well behaved dogs are welcome, but must be crated when left alone. Just 4 blocks from the Plaza! Also the Casita is just 18 miles from the ski area Ski Santa Fe, David and Sally are avid skiers and would love to show you our Mountain. 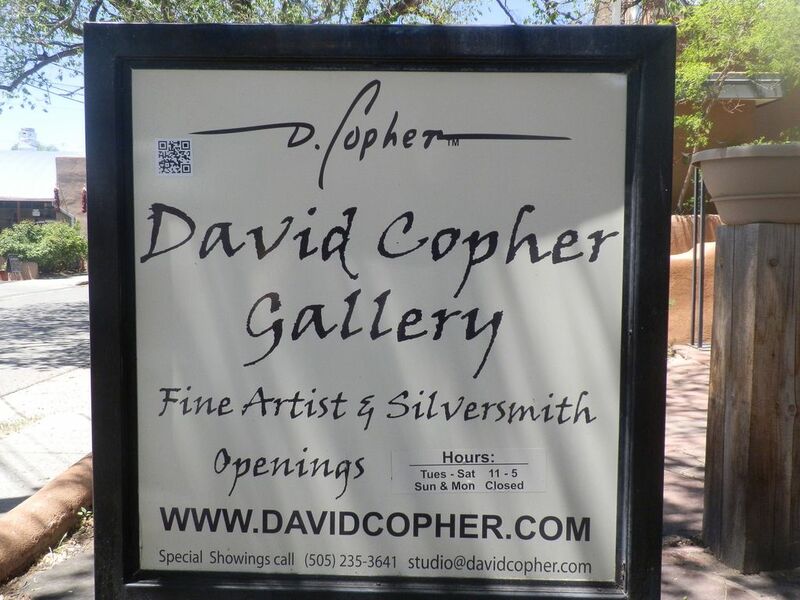 David Copher is a well known artist . Gas burning stove keeps you warm and cozy. Any thing you would need to make a meal. private patio with lounge chair, umbrella and dinning table . The Cottage was cozy, well appointed, very comfortable bed, nice and clean, high ceilings, and the artwork was by the owner. The kitchen area was designed for Tall people, so I was vertically challenged with anything above the bottom shelf in the upper cabinets. I did find the step stool in the bedroom closet! The location was perfect for the historic district,and sat behind the owners gallery and studio. There are several restaurants within a block of so, and the Santa Fe cooking school just down the street, and on the other end is Gorgia O’Keefe Museum. There is free shuttle nearby, for getting around, to the places too far to walk, parking is at a premium, so if you can walk, bike, or shuttle do so. With all the old buildings, museums, there is so much to take in. When the legislature is in session, don’t even try to visit the capital it’s a Zoo. This city is an art lovers dream, and a bit overwhelming. The term “shop til you drop” must have originated in Santa Fe. I would definitely recommend staying with David and Sally, they are excellent hosts and Tennessee is an excellent greeter to the gallery and loves to be petted. Wonderful Casita in an excellent location! Definitely needed more time to enjoy it all. We thought this was a great place in a great location close to many thing. It had everything we needed. This casita is four blocks from the Plaza. It is nicely decorated with pieces of the owner’s own art. It is small, but just right for two people. David and Sally were cooperative and communicative. We enjoyed our stay and may return on our next trip to Santa Fe. We had an amazing time in Santa Fe. Thanks! Thank you so much for your review. Come back soon! Awesome home away from home! We are ideally located in downtown Santa Fe, in easy walking distance to three of our best museums, excellent dining and quaint cafes and the historic Plaza, as well as great shopping. There is an additional fee for a third person of $50.00 per night. no more than 3 adults . Any damage or missing items will be charged to your c.c on file.